The motorcycle officer was involved in the crash near Charleston Boulevard and Torrey Pines Drive. This is a roundup of all the breaking news from around the Las Vegas valley for August 20, 2018. Nevada Highway Patrol is investigating a fatal collision between a pedestrian and a vehicle that occurred on U.S. 95 near South Jones Boulevard. U.S. 95 is closed down between South Valley View Boulevard and South Rainbow Boulevard while the investigation takes place. Avoid the area. Las Vegas Metro Police are investigating a stabbing at the Wild Wild West Casino. Officers say two men got into a fight just before 5:00 P.M. tonight when one man stabbed the other in the chest. The victim was taken to University Medical Center. Police say the victim has serious injuries. One person is in custody. 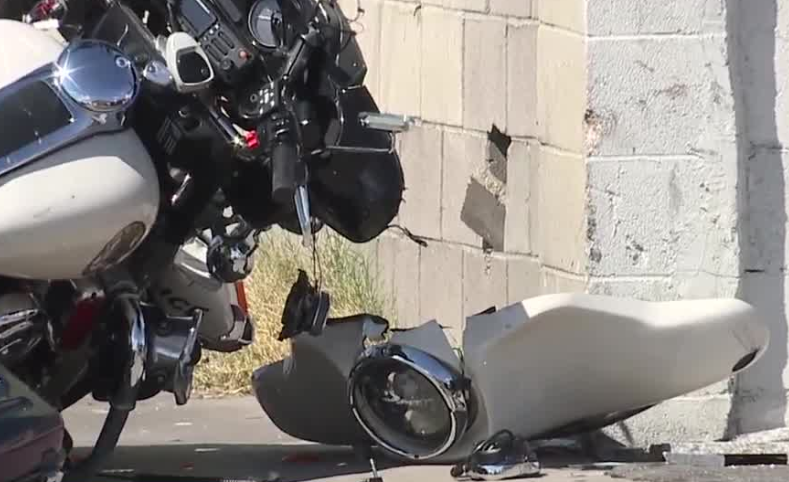 A Clark County School District police motorcycle was involved in a crash near Casada Way and Torrey Pines Drive, just north of Charleston Boulevard. The officer has been transported to the hospital. Las Vegas Fire & Rescue reports that a man has moderate to serious injuries after being hit by a train near Washington Avenue and Main Street. Firefighters pulled the man from underneath the train. The man was transported to UMC Trauma. Rainbow Boulevard near Hacienda Avenue has reopened after the crash. A crash has blocked all lanes of traffic on Rainbow Boulevard near Hacienda Avenue. Police said 20-year-old Paul Perry of Jordan, Utah, was critically injured in a crash near St. Rose Parkway and Bermuda Road. For unknown reasons, the driver traveled off the south side of the roadway and impacted the concrete base of a large metal pole on the southeast corner of the intersection. The driver was transported to UMC Trauma from the collision scene with injuries determined to be life threatening. A man was shot in the arm in an alley near 490 North Circle near Paradise Road and Twain Avenue. He was transported to a local hospital. No arrests have been made at this time.